Dit is het ultieme wijnspijsrestaurant van Amsterdam. Je kunt in dit ongecompliceerde restaurant kiezen voor een 3-, 4- of 5-gangen diner waarbij Hans Verbeek bijpassende Europese wijnen voor je inschenkt. Niveau 1 staat voor een menu met goede wijnen en niveau 2 betekent nog betere wijnen voor bij het menu van de dag. Uit de keuken komen met zorg opgemaakte bordjes met bijvoorbeeld coquilles, Anjou duif of hun signature meringue dessert. Lekker relaxed achterover hangen en volop genieten luidt het devies. Tip van bySam: Je kunt Utrechtsedwarstafel ook afhuren voor een privédiner. Ideaal als je de tent helemaal voor jezelf wilt hebben. Level 1: Menu with good wines. Level 2: Menu with the best wines. Dancing with food. 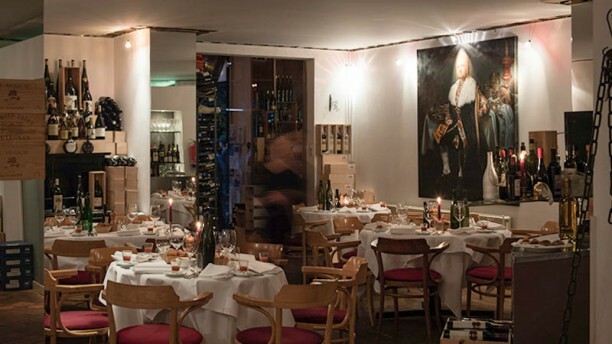 Owners Hans Verbeek and Igor Snes of restaurant Utrechtsedwarstafel in Amsterdam create a ballet of wine and food as they compose a trip through culinary delights. And if their gastronomic art is not enough, around the corner is Theater Carré to lenghten this lovely flow. Tram 4,10,7 or Metro 51. Car park Paid parking in the neighborhood. Wednesday until Saturday from 19:00 - 00:00. Monday, Tuesday, Sunday opened for Private Dining only. The food, service and atmosphere was excellent! We had a wonderful evening thank you! Excellent food and wine. We had the 4 course e95 menu and it was top! Fantastic food in a kind of private atmosphere. We very much enjoyed the evening. I do not care for octopus- or at least I didn’t until I ate it here! For the nervous among us, it is slightly disconcerting to be offered only a choice of the number of courses and a choice as to good wines or even better ones. But be brave and put your trust in those who know better - the chef is extraordinarily good. The wines weren’t bad either! Great food where the chef allows the seasonal fresh ingredients he uses to shine. His creations are really amazing. The wine pairings are perfect to enhance each dish. First restaurant where the chef brings the food to you and explains what is in each dish. The person who selects the wines is a true professional and takes the time to explain where the wine comes from and the specific characteristics of each selection. Very friendly and warm atmosphere. Liked it so much that we decided to come back our last evening in Amsterdam. If you are a foodie, this is the place to go. good food and wine, but too much overpriced. no indication of the costs either. there are plenty more restaurants in Amsterdam that serve the same food but at much more reasonable prices. Also, it was a special occasion mentioned in the booking. Restaurant did not follow up. Disappointing. Loved the food, the presentation and very welcoming host, Hans. We took the three course meal and enjoyed every bite. Even though we opted for the cheaper Level 1 wine pairings, they were still very good. The chef, igor, personally brought the food out to us so he could explain the dishes. The understated restaurant makes it even more quaint and a delightful experience. Would definitely come back for the four course meal.